if you're on the internet (heh heh), get yourself over to the riddim method and check out my mashups of cypress hill and rita marley, elvis costello and jack white. 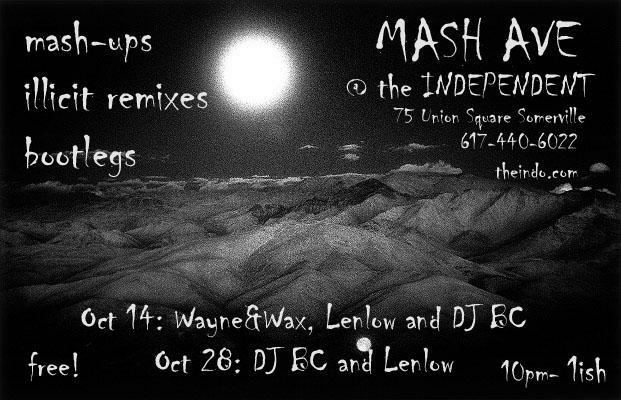 if you're in the boston area, come on over to the independent tonight and hear me, DJ BC, and lenlow offering up plenty of boots and bastards for the mash ave massive. man its really a small world. i know you! looks like you found your way to our blog via jace..
did you check out the baile mix? hmmmm. i'm puzzled. but no surprise on smallworldness. reasoner rocks! glad to know it's got a boston connection. haven't yet downloaded the baile mix. lacking room on the ol' harddrive at the moment. hope to soon, though. hope you can make it. i can't take too much mystery. thanks! reasoner is actually a bunch of kids from around here. would love to hear what you think of the mix. i spent a month this summer in brazil (working at cc no less) and loved it. i helped cook veggies for the visiting jamaicans chez nesson and saw you at the red tail "goa" party in april. does that help? ah, gotcha. i was really blanking there for a minute. i noticed that reasoner has a number of contributors. i think the format is great--not to mention the content. we'll see if this crappy weather doesn't keep you and everyone else away tonight, but i'd love to hear about brazil sometime. i'll download the mix tomorrow, when it won't matter if it competes with ableton for drive space. well in the end writing a paper kept me from going out (damn this school), but do keep me posted on your gigs.. how did it go? and btw, a belated congrats on the one year anniversary! Wayne- great night, eh? We got a little scene going there! Thanks for bringing out your peops. Also I listened to your CD twice today. It's good stuff brother! "Was pretty cool. He mixed 3 songs from Boston bands that worked great -- the beat from Bel Biv Devoe's Poison, with Centerfold and More than a Feeling -- who knew they had the same chords? " Any chance of getting that as a stand-alone track? hey atari, no sweat. it went well, though. a surprisingly good turnout given the weather. there was even a good bit of dancing going on. BC and lenlow have got a good thing going over there. and, BC, great to hear about the interest in that portion of the mashacre. i'm going to try to cook it up as a standalone ASAP. and glad you're digging the album! thanks again for having me at mash ave--it was a blast.